The proverb comes from Japan, the origin of the concept of ‘Ikigai‘. Ikigai is now the subject of a new book, and writers Hector Garcia and Francesc Miralles claim the idea has a great promise. They say ikigai – meaning ‘purpose’ or ‘raison d’etre’ – is the Japanese secret to a long and happy life. Japan is indeed a good place to look for longevity. At 74.9, it has the highest healthy life expectation at birth. A Japanese person that is 60 years old can be expected to still live 21.1 years in good health. And the share of centenarians is far above the global average. In the region of Okinawa, Japan’s southernmost region with a subtropic climate, there are even about 50 in 100,000 people who are older than 100 years. Ikigai, say Garcia and Miralles, is what makes people reach one hundred years. Putting it more poetically than purpose, they refer to Ikigai as ‘the happiness of always being busy’. In Japanese, it is written as 生き甲斐. It can be broken down in 生き, life, and 甲斐, to be worthwhile. Everybody has an ikigai. If we know what it is, it shapes our days. If we are unsure what our raison d’etre is, we still carry it in ourself. And it’s broader than our passion or desire. 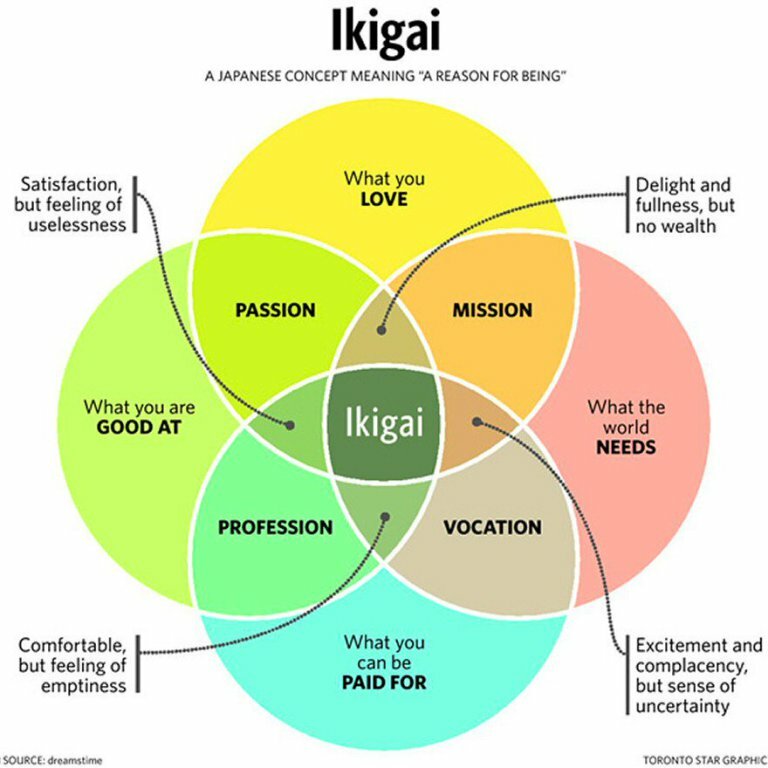 Instead, ikigai combines four elements: what you love, what you are good at, what the world needs, and what you can be paid for. The four dimensions of Ikigai. Source: Toronto Star, diagram by Mark Winn. All good so far. Now we know what ikigai is, let’s turn to Garcia and Miralles to find out how Okinawans live to a hundred years and more, and how we can find our personal purpose following their lead. healthy diet, based on a lot of green tea, large amounts of vegetables and fruits, soy products such as tofu, and low sugar consumption. Also, people tend to eat from smaller plates, and until their stomach is 80% full. No all-you-can-eat buffets! closely tied communities. Individuals are part of a moai, or a support group of people with similar interests who look out for each other. a good dose of daily activity of low to moderate intensity: Lots of walking around, and people spend time to tend their gardens. regularly sports activity. Again, these tend to be low to moderate in intensity, like yoga, tai chi or qigong. The secret to a long life is not to worry. And to keep your heart young – don’t let it grow old. Open your heart to people with a nice smile on your face. If you smile and open your heart, your grandchildren and everyone else will want to see you. I plant my own vegetables and cook them myself. That’s my ikigai. Chatting and drinking tea with my neighbours. That’s the best thing in life. And singing together. Do smiles, vegetables and tea really provide purpose to a life? While these stories are nice to read, they come from a different origin than ours. Of course we can feel inspired by Japanese 90- or 100-year-olds to do tai chi or qi gong, and to replace our third cup of coffee by a green or white tea (I am trying! ), but helping me to find the purpose in my daily life here in Europe is a bigger feat. Rather than spending a few dozen pages on explaining all tai chi postures, the book could have expanded to offer insights from, say, Japanese philosophy or global psychology on where people find purpose, to inspire the reader to apply these in daily life. Is it really as simple as smiling, growing vegetables, and drinking tea with neighbours. These are sure moments that provide happiness, but does this mundane enjoyment of life really provide purpose? Is it all we need to come to terms with the negative sides of busy lives in the West? The book also doesn’t dispel another myth. While concrete data on Okinawa itself are hard to come by, as a country, Japan is not too happy. It has indeed the highest Healthy Life Expectancy worth wide, but isn’t scoring as high in the World Happiness Report. In the 2018 edition, it ranks 54th, just below Latvia and just ahead the happiest country of Africa. Asia’s happiest country – Taiwan, is far ahead at spot 26 in the ranking. Having an ikigai helps, but might be more of an ideal picture than a story representing society at large.